Here is a lovely little pattern to enjoy this fine Spring Equinox! 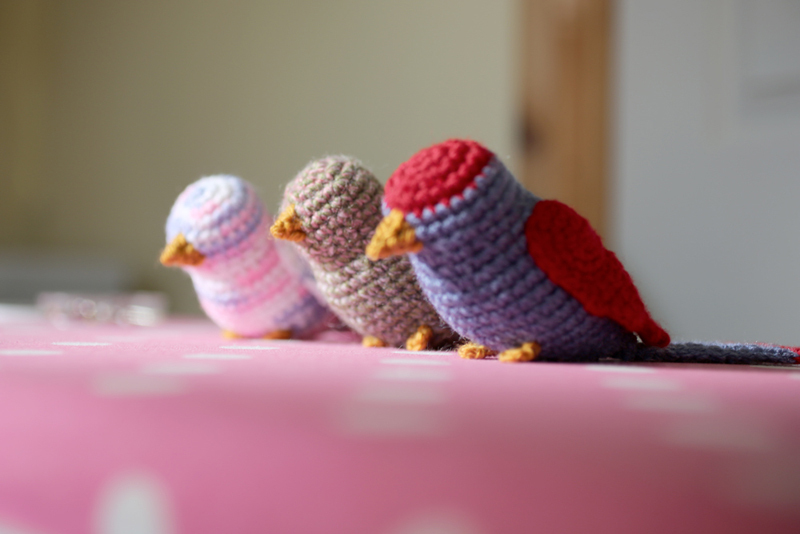 I’m currently in the process of making a flock of these little chaps, they take a couple of hours each but I do recommend pinning them out and blocking overnight to counteract a little twist in the tail and wings once they’re worked up. 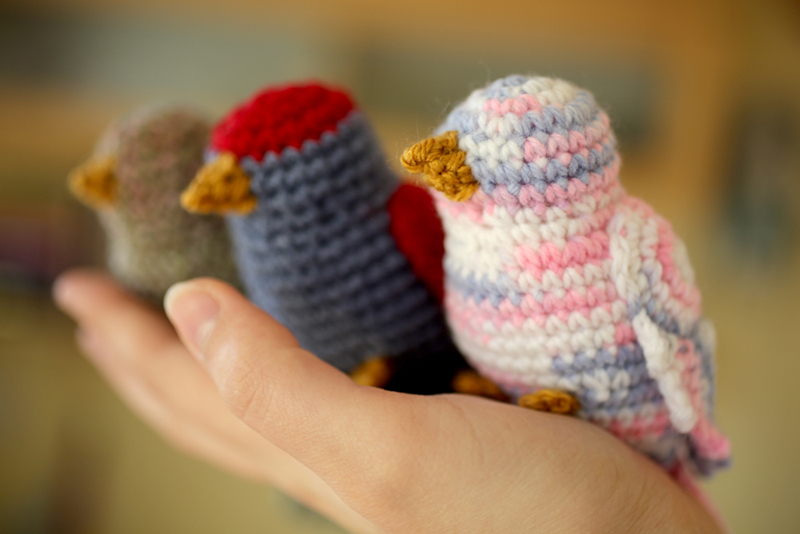 I have also realised that they have no eyes, so you could embroider those on or add safety eyes to finish. **ch 8, ch 1 and turn. row 3 missing the stitch at the base of your hook, dc 7, ch 1 and turn. row 10 dc 1, sl st to oval. Break thread and pull through to finish. Work same as right wing , inserting the following section in place of the pettern between ** **. **ch 9, ch 1 and turn. turn work a quarter turn to work the end of the tail. Work 6 tr into the same place, ¼ of the way along the edge of the tail. Sl st into centre of edge of tail. Repeat this last step again but into a space ¾ of the way along the edge. Sl st into very end of edge of tail, break yarn and pull through to finish. rnd 2 dec 1, dec 1, dec 1, break yarn and pull through to finish. 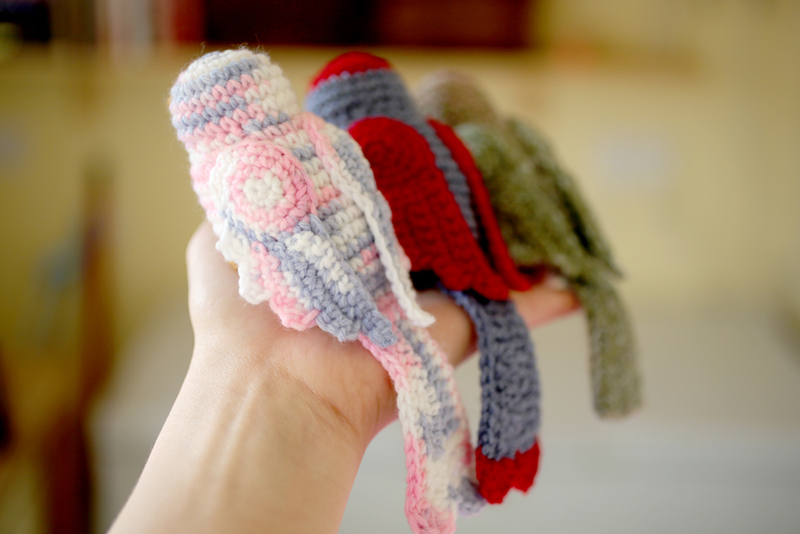 Use end of yarn to sew up ends. Surface crochet 2dc in position on front of bird, ch 1 and turn. Dc 2, break yarn and pull through to finish. Stuff bird body through gap at end. 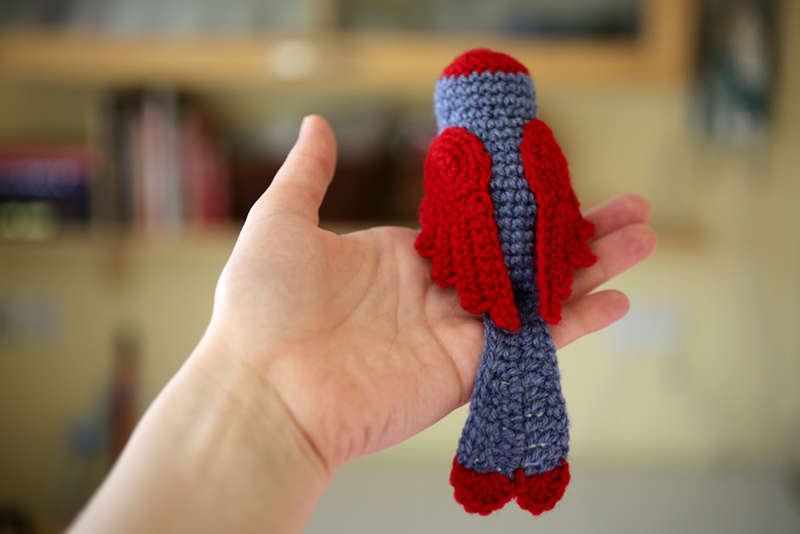 Sew tail to base of body, and wings in place on bird. Weave in all ends to finish. 20 Mar	This entry was published on March 20, 2015 at 8:21 pm. 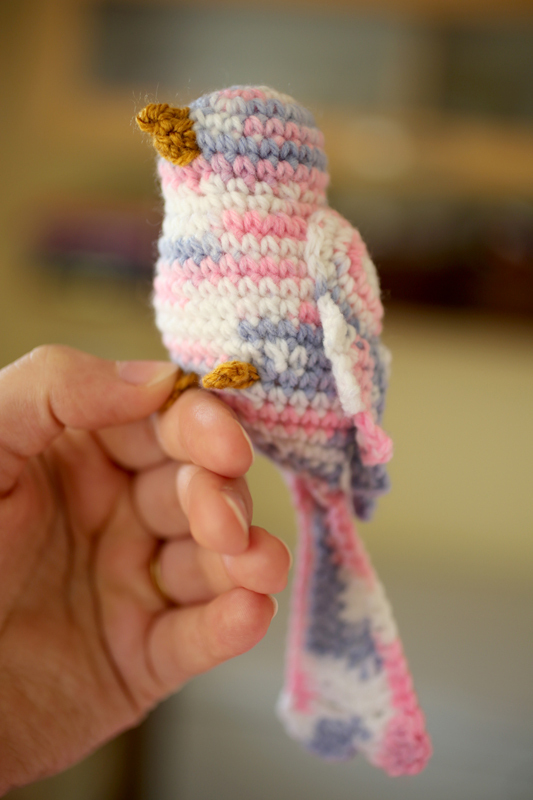 It’s filed under crochet, pattern, toy and tagged amigurumi, bird, birdies, burton upon trent, craft, crochet, crochet design, crochet pattern, free pattern. Bookmark the permalink. Follow any comments here with the RSS feed for this post. And biggest fan of you 🙂 hahaha. May i it will be translated into Korean? No plans for translations yet, but so glad you enjoy the patterns! Thank you so much for the pattern! Really enjoyed making this and thought it came out great! 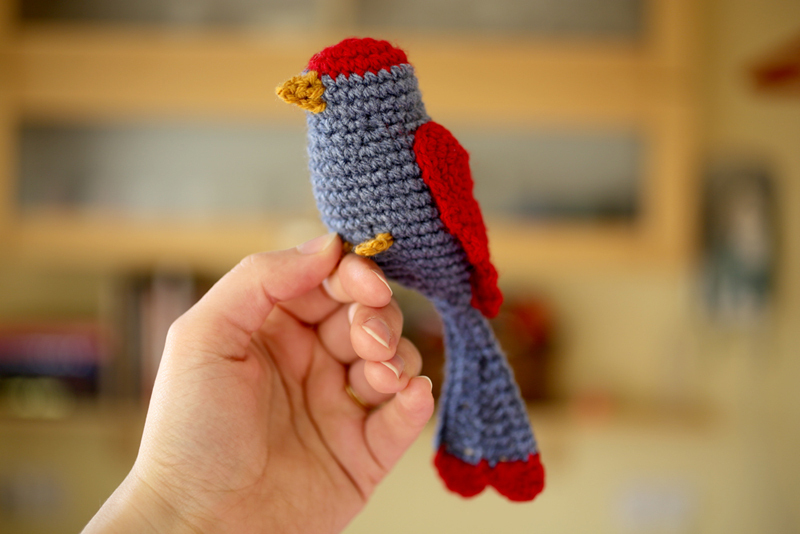 Made a blue bird for my dad because he loves birds. It really worked up fast and looked great, well done! So glad you enjoyed making them! I live in Louisiana USA and I just love your bird patterns ! Thank you very much . I make them for children as gifts ! 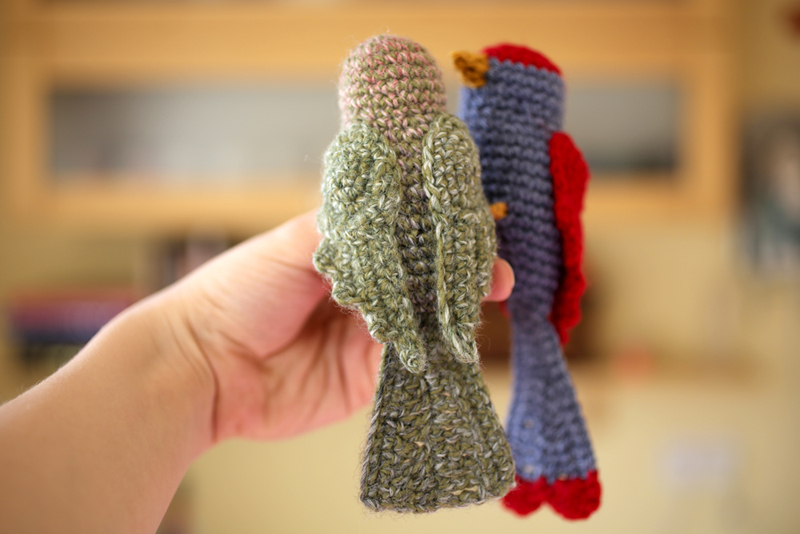 I am new to crochet and have found your beautiful birds. I have noticed though, that there are 2 types of tail bottoms; a scalloped one and a fanned-out one. Do you have the instructions for the fanned-out one please? Many thanks for any help! Querida, lindos pássaros. Já fiz o corpo. Ficou lindo. A asa direita também. Porém a esquerda nao está bem clara. Não consigo de jeito algum. Me ajude or favor. Sou do Brazil. Estou feliz que você gosta das aves. Você pode fazer uma segunda ala o mesmo que o de direita para anexar para o lado esquerdo. Isso pode ser mais fácil. Hallo I’m Indah. Live in Indonesia. 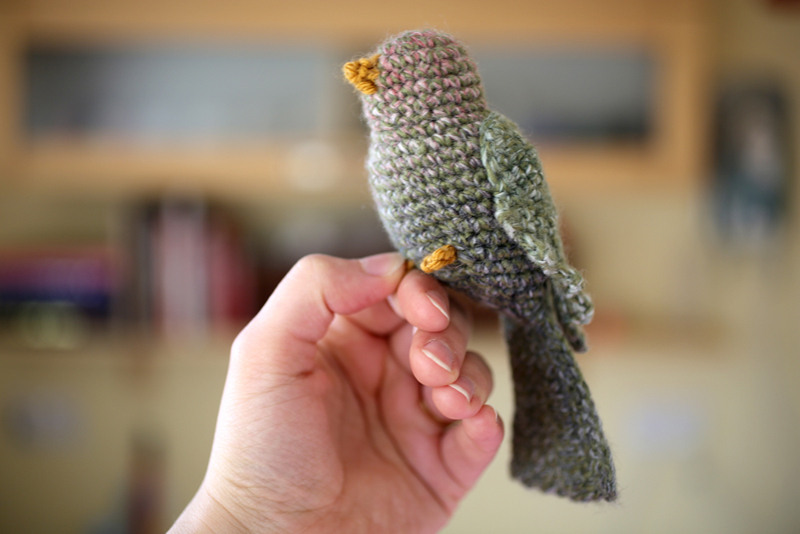 Your crochet is so adorable. Can I translate in bahasa? These little birds are so cute, I absolutely love them. Thank you so much for sharing your pattern and tutorials. You are so welcome, thanks for visiting! Good morning. I love your pattern for the bird. It’s beautiful. I was wondering about the “twist” part to make the left wing. I don’t understand what that means exactly. No matter how I’ve looked at the work I can’t figure out what that means to do the second wing. Would you be able to elaborate for me please?